Da-Lite Da-Snap Projection Screen, HC Da-Mat, 4:3, 100"
Da-Lite Da-Snap is suitable for mounting on the wall or into wall opening. 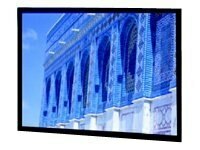 Easily attached front or rear projection screen surface with snaps or optional Velcro. Da-Snap provides a perfectly flat viewing surface for video projection applications. Pro-Trim is a fabric frame covering that aesthetically enhances the appearance of the installation while absorbing light that surrounds the viewing area.